Last week I threw a mini surprise party for my lovely friend Sian, which meant my flat was filled with bunting & balloons (and, er, loads of cut-out masks of Sian's face, which I now don't know what to do with). 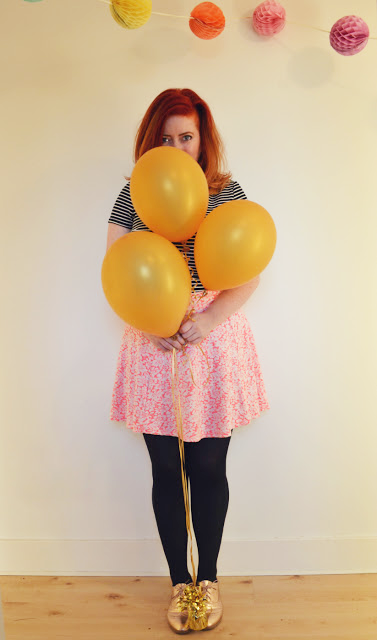 I had such a nice time, so I wanted to show off what I wore that night (mainly because it gives me an excuse to play around with the balloons that are lasting FOREVER). My stripey top is actually a dress from New Look - I bought it earlier in the summer, and was gutted when it shrunk in the wash and was too short to wear... until I realised it sat really nicely under skater-style skirts! The skirt is from H&M and has been a staple in my wardrobe for ages, I've worn it on holiday, to work, to music festivals, you name it, it works for (almost!) every occasion. I love this style, and I love that H&M have a new version of this skirt every time they update their collections - I think it's super flattering, so it makes my clothes shopping simple! I've already blogged about these shoes in my candy cane outfit post, but as predicted, they are all I want to wear at the moment. They're from George at Asda and they are as lovely as they are shiny. 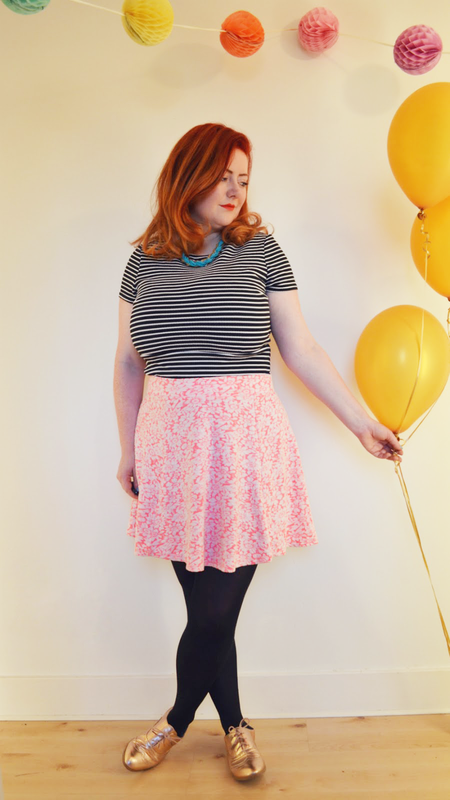 Love that skirt, I wonder if I can pull it off with my mum-tum.